Last review was about nail hardener and this range offers all the nail colors with hardener. Truly, I dint find any flaws instead I love the color along with its cute fat bottle. Quality is good, dries fast, doesn’t chip early… whatelse you need? 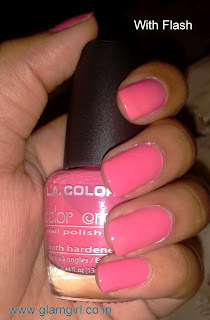 L A colors seems to me nail color heaven 😉 :P…. such a wide range of colors.